If you remember our Sokhi Team Real Traders booked amazing 7000-10,000 Profit in our Short Call in Nifty. I had pointed out that the reason we sold, It was the Divergence in Nifty Weekly RSI 2 which gave us the conviction to HOLD our Shorts ! Yesterday we received the over-whelming response from you all and asked us to share the Nifty Weekly Charts Showing RSI 2 and the Divergence. I don't believe in keeping Secrets when it comes to Sharing your Knowledge. I believe in the saying " Knowledge increases by Sharing but not by Saving ". 1. 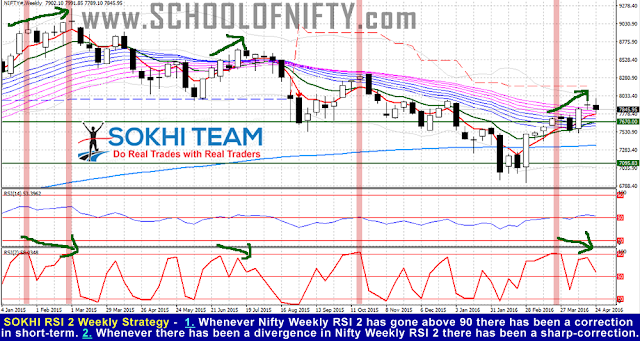 Whenever Nifty Weekly RSI 2 has gone above 90 ( Red Lines Drawn on the Charts) there has been a correction in short-term. Hence If you are planning to go Short on NIFTY FUT or Nifty CALL Options or Buy PUTS for Positional trading just check this chart setting it shall given you conviction. 2. Whenever there has been a Negative - Divergence in Nifty Weekly RSI 2 ( Green Arrow Drawn on the Charts ). There has been a sharp correction in the short term. This also works when there is a Positive - Divergence. Hence if you are planning to BUY NIFTY FUT or Sell Nifty PUTS or BUY NIFTY CALLS for Positional Trading just check this chart setting. I also INVITE YOU to join our SOKHI TEAM from this Series to trade under our Guidance.. If you are still skeptical to be a Part of SOKHI TEAM - See these 5 PROOF VIDEO !